As of today we have raised $2955 in direct donations, pocket square donations, and pre-sales, plus a $650 grant from the Chequamegon Bay Arts Council. That totals to $3605. We still have $4395 to go! Many thanks to those that contributed. Consider making a donation or pre-order to help offset the cost of our trip. Last Spring we visited Japan for the first time (more details in this blog post) and what we saw and learned there changed the way we see the world in many ways. There is so much to appreciate about Japanese culture and so much to learn. As makers and designers, the use of texture, the dedication, great skill and humility that goes into making craft, and the tradition of using woodenware are a few of many reasons why we want to return. Exploring these things will bring our work to the next level. Jarrod taught green woodworking at the Gifu Forest Academy. A DVD called One Tree was made of the 5-day course—the first of its kind in Japanese! Check it out here. We had an introduction to applying urushi lacquer on bowls and spoons, then explored using this very special finish our own woodenware when we returned home. We looked at how wooden handcraft fits into Japanese life and commerce at galleries, shops, and in people’s homes. Jarrod studied under a Master turner where he learned Japanese turning and forging techniques. Jazmin visited a museum of shibori tie-dye textiles in Arimatsu and saw them being made. Jarrod taught pole-lathe turning in Fukushima where he met a young craftsperson who studied with him this past summer. We met basket makers, carvers, and artists which culminated in facilitating a Traditional Japanese Tray Making Course at North House Folk School, MN with master Japanese woodworkers in March 2019. In March after hosting and traveling with Japanese woodworkers to North House Folk School, MN, we will accompany them on their flight back to Japan. Jarrod will teach at the Gifu Forest Academy and Jazmin will take lessons in urushi lacquering techniques. Jarrod will study with a master turner and his apprentice in Takayama. We will visit craftspeople; a well known woodworker at his workshop and a few different toolmakers near Kobe, a master indigo dyer and a hand weaver both near Tokyo. We will visit museums including: the Carpenter’s Museum, the Mingeikan Folk Craft Museum, and the Iwatate Folk Textile Museum. We also plan to visit handcraft galleries, including a very special basket shop. We will document our trip through instagram photos, newsletter, and the blog. The sharing will continue into the future through teaching, mentoring, lecturing and advocating for traditional craft and The New Wood Culture. What we learn will continue to transform the craft products we send out into the world. A small grant from The Chequamegon Bay Arts Council and teaching will cover a portion of the trip cost. We need to raise the remainder through pre-orders of cups, bowls, & spoons and contributions from you. Supporters of $25 or more will receive 5 postcards created from photographs of our 2019 Japan trip as a thank you gift. Urushi lacquered or milk painted cups and bowls, and Urushi or oil finish soup spoons are available to pre-order and will be sent as they are completed between Spring and Autumn 2019. Newly added! Blue Japan Fundraiser Pocket Squares handwoven with 100% linen are ready to ship and have an option to add $5 to your order as a donation. 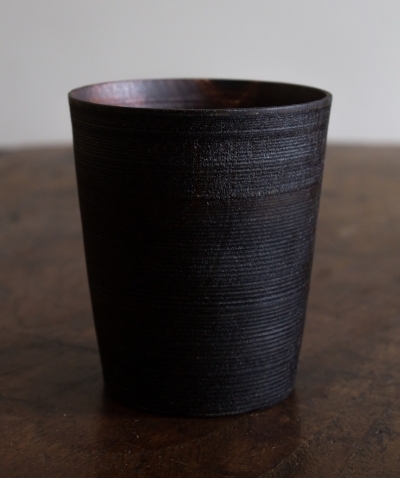 Your donation and/or purchase will contribute to our work in connecting with craftspeople through the exchange of ideas and skills, to refining our production and designs, and to producing urushi lacquered woodenware in the US. Learn more about Jarrod & Jazmin here. Here we are taking an urushi lesson. Photo by Masashi Kutsuwa.